You say wicked like it's a bad thing. Oh, honey, we like to be wicked. It's what gets us up in the morning, and fills our dreams at night. We have studied, and practiced, and become proficient in the arts of the wicked. We like our black dresses, and sharp pointy shoes. We like the smell of old books filled with curses. Some people see wicked as a bad thing. We don't know where they got that idea. Okay, well, maybe they were someone who meddled in our business, and ended up cursed. Or perhaps they were trying to take our throne. Well, what are we supposed to do to usurpers? Let them go? No, no, no. We curse them, we hex them, we jinx them. Then we let them go. 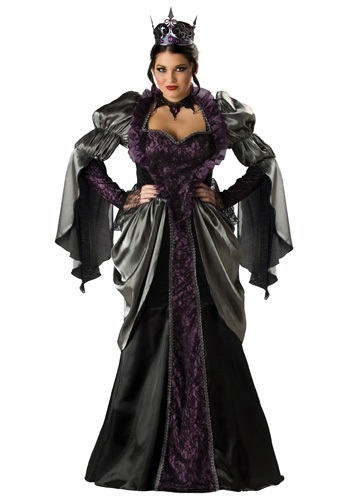 If you are feeling a little wicked, slip into this Plus Size Wicked Queen Costume. You'll be mixing potions that turn ungrateful subjects into frogs. And writing curses meant for anyone who tries to take your kingdom, leaving them penniless, and unrecognizable to everyone they know. All the while wearing this black, and purple dress. Everyone will instantly recognize you as the Wicked Queen when they see your long pointed draped sleeves, and lacy jeweled necklace. And when someone steps out of line don't be afraid to put a little hex on them. It is so good to be wicked after all. this is suppose to be for a plus size woman and the model is not. When you put this on a plus size person, like me, it make the hips and rear look like a huge hippo. This dress is very unflattering for and on a plus size model. Sorry I am being rude, but also truthful. I would not recommend this to any woman over a size 16. Not good for plus size. It is beautiful in person.